I’m on a major shoe kick lately and felt like doing something fun to brighten up a couple of pairs of shoes that I already had. So, I put together a tutorial for giving your own shoes a makeover, just in case. And then I got a tiny bit carried away and turned it into 3 different shoe tutorials. Haha. I partnered with Testors, who you may remember from may last airbrushing project, to bring your some DIY ideas that are going to be shoe-win. And if you’re still willing to check out the projects after that pun, you totally deserve a pair of these! 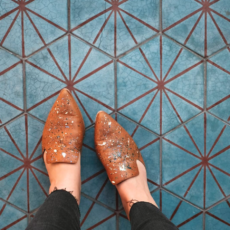 Click through for all 3 DIY shoe tutorials. 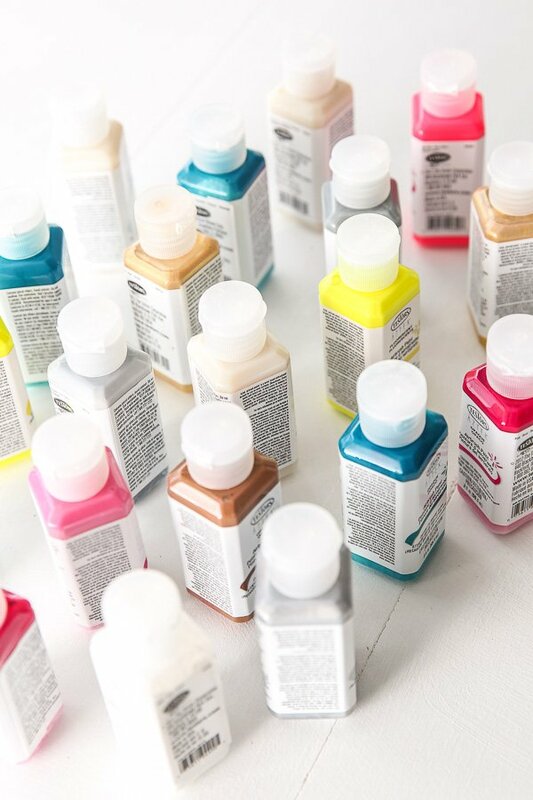 For all of the projects below, I used an acrylic paint spray set because it’s super easy to manage AND you can mix your own custom colors super quickly. The kit comes with paints, but I opted to use the larger bottles of airbrush paints for this one, which worked really well. The airbrush itself is handheld and they’re aren’t any cords, so it’s great for loads of DIY projects (not just shoes). I highly recommend giving it a try. Available at Hobby Lobby stores and on Amazon (which is where I bought mine). 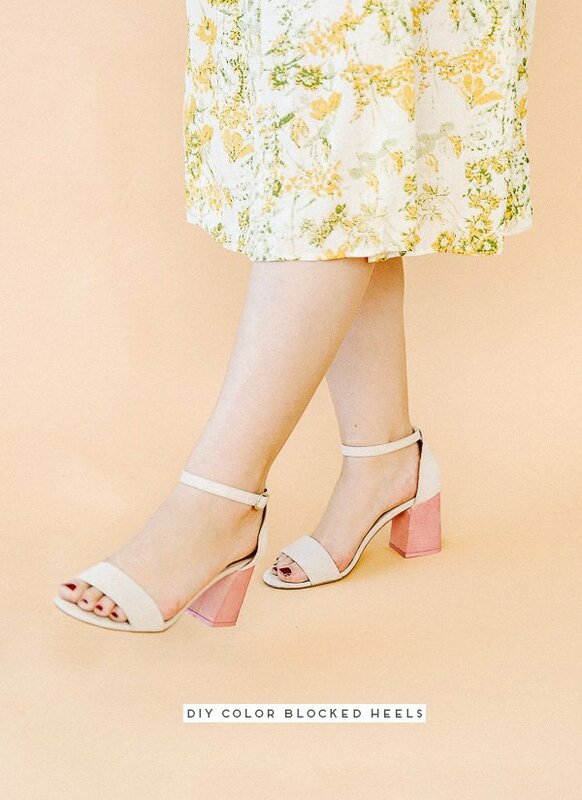 For the DIY color pop heels, I used these shoes. They have a pretty chunky heel, and were otherwise pretty plain, so I thought a colorful heel would be cool. I started by taping off both shoes with painter’s tape, so that only the heels were exposed (I used some clear plastic to block off the rest of the shoe, which was really helpful). Next, I mixed up a custom color in an empty mixing bottle (also from Testors). Muted pink color formula: 3 parts brown, 2 parts pink, and 1 part white (all opaque). Shake well to make sure the colors are fully mixed. Then, I poured that mixture into the glass mixing bottle and added the clip cap. Then, I added the spray trigger to the propellant can, and clipped the the glass mixing bottle onto the spray trigger. There is a diagram of everything and directions for putting it together that comes inside the kit, but it is much easier than it sounds. It takes 2 seconds. More info here. Then, I just spray painted the exposed heels (keeping the spray about 6-8 inches away from the heel). It’s better to keep the paint sprayer upright in one position and move the shoe around, if you can, so the paint doesn’t run out from the top. Let the paint dry to the touch, than remove the painter’s tape and plastic, add a sealant if necessary. Done! 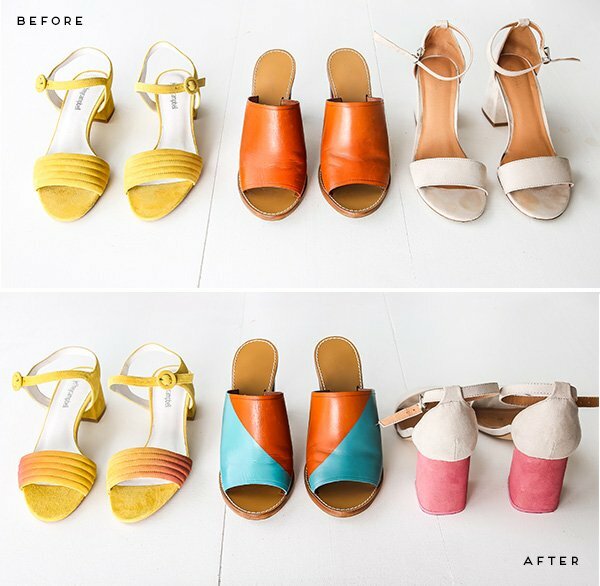 For the color blocked DIY shoe makeover, I used an old pair of shoes from J.Crew. I’ve probably had them for three or four years and never really worn them. So, I figured they would be a good candidate for a makeover. I started by taping off both shoes with painter’s tape, at an angle. And made sure to match the angles up (mirror image – so the reverse) for each shoe. Then, I taped off all the other areas that I didn’t want to get paint on (the sole, the heel, the toe, etc). Next, I mixed up a custom color in an empty mixing bottle (also from Testors). Teal color formula: 2 parts turquoise, 1 part dark gray, and 1 part white (all opaque). Shake well to make sure the colors are fully mixed. Then, I poured that mixture into the glass mixing bottle, added the clip cap. Then, add the spray trigger to the propellant can, and clipped the the glass mixing bottle onto the spray trigger. Then, I just started spraying the paint onto the shoes (about 6-8 inches away). It’s better to keep the paint sprayer upright in one position and move the shoe around, if you can. Let the paint dry to the touch, than remove the painter’s tape, add a sealant if necessary. Done! 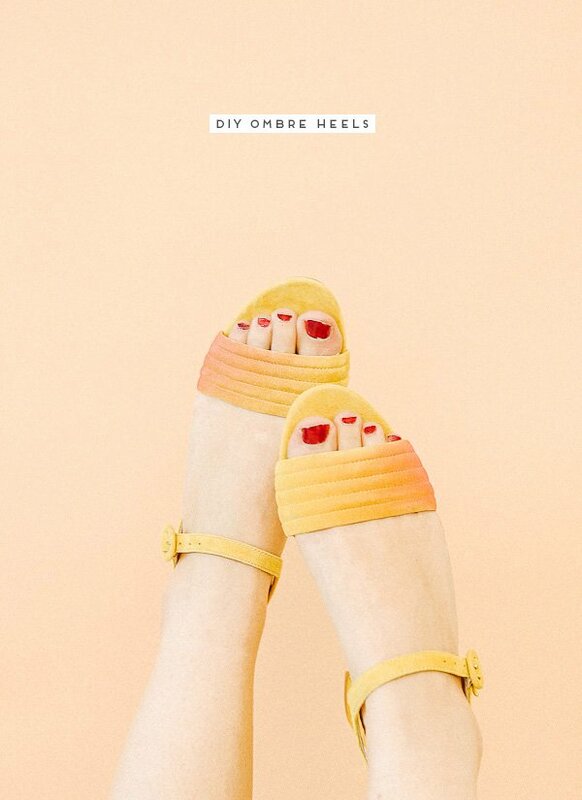 For the ombre DIY shoe makeover, I used these shoes. I love the mustard yellow, but wanted to add a little more color to the toe, so I mixed up a muted pink (the same color I used for the color pop heels) and got to work. Muted pink color formula: 3 parts brown, 2 parts pink, and 1 part white (all opaque). Once the color was mixed, I poured that mixture into the glass mixing bottle, added the clip cap. Then, add the spray trigger to the propellant can, and clipped the the glass mixing bottle onto the spray trigger. Next, block off all the areas of the shoes except for the toe. I used a brown paper bag and taped it around the shoe, which worked really well. Then, start spraying the toe of the shoe (about 6-8 inches away), focusing mainly on one side of the strap, to get the gradient effect. Then work you way (lightly) down the rest of the shoe strap briefly. You want the majority of the paint to just be on one side, as shown in the photo. Repeat this process with the other shoe. Let the paint dry to the touch, than remove the paper bag, add a sealant if necessary, and they’re ready to wear. Which pair of shoes is your fave? Have you ever tried anything like this before with an old pair of shoes? This post is in partnership with Testors. Thank you for supporting the brands that help keep Paper & Stitch running. < previous postAre You a Neutrals Girl or a Color Hunter? 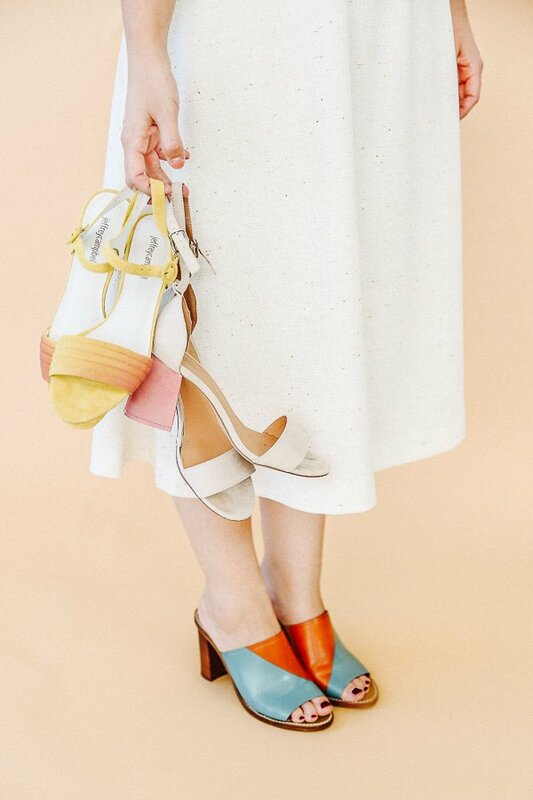 I love the idea of color blocking the heel! That would be a super great way to add some new spring color to an old shoe. I feel like it would super fun to use these same techniques to add a colored toe to a basic ballet flat. This would definitely work on a basic ballet flat, Nichelle. I actually had some that I almost used for this, but I wanted all of them to be heels. 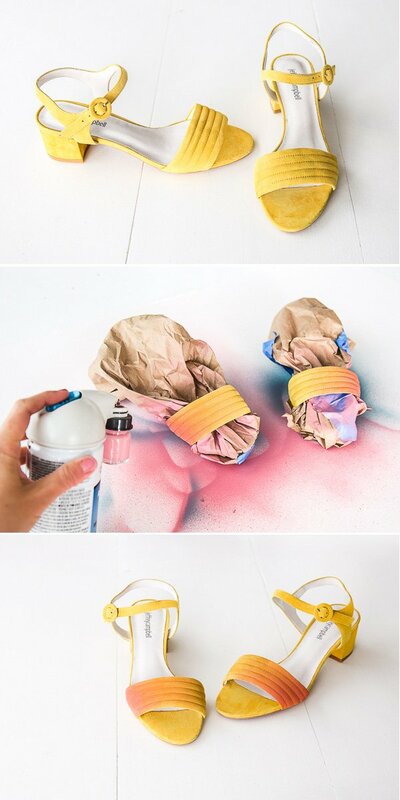 Definitely love the idea with the pop heels, and this spray paint mixing system is so cool! Thanks Michelle. It’s my new favorite thing. Great idea! I have some pairs of shoes that I don’t wear, and I think I will use this technique to renovate them. These are all amazing! 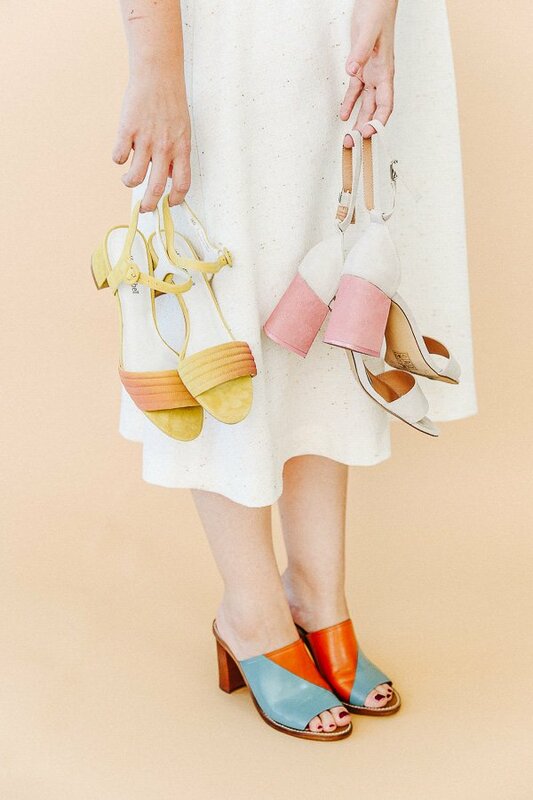 I especially love the ombre heels. Need some! Wow! This is a very creative share! I’d never even thought of doing this. I’d definitely try out your advice and hope the result is the same as yours! Keep on sharing! Loved the ideas and creativity that you shared! I’ll definitely try them out and hopefully they’ll have the same results such as yours. What great idea!! i have some pair of shoes in m y home, but i don’t wear it,so after read this i’m thinking that, i will use this formula to renovate them. I love the above ideas shared. Very creative. Thank You. 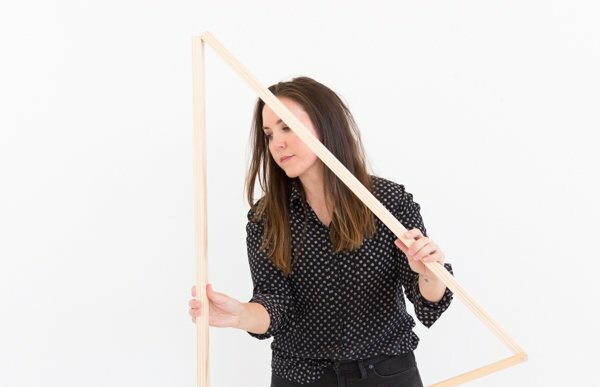 It allows me to think more outside the box. 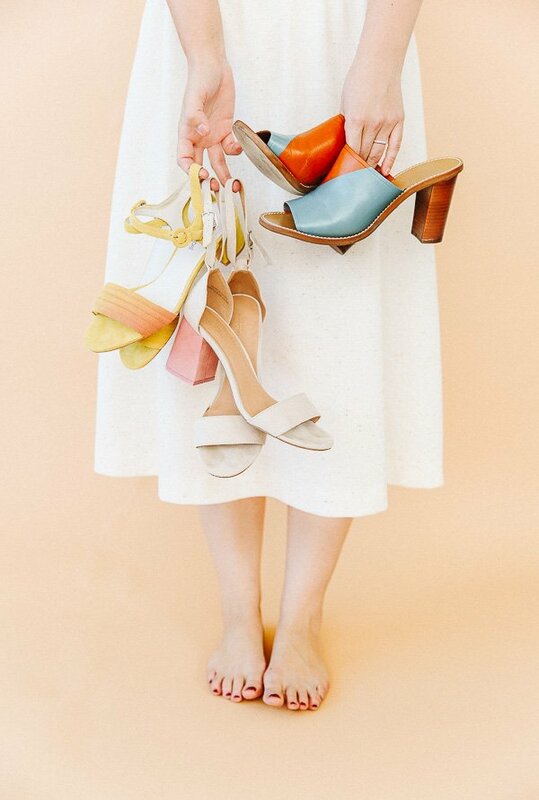 this gives me a lot of idea on what to do with my old shoes!thank you so much for sharing this.i really love the hombre feels of the mix of colors.